Reverting to my legally-given name, Hardsparrow, I've submitted this painting for The Link exhibition, taking place at the Music Library in Edinburgh, from today until the 16th. 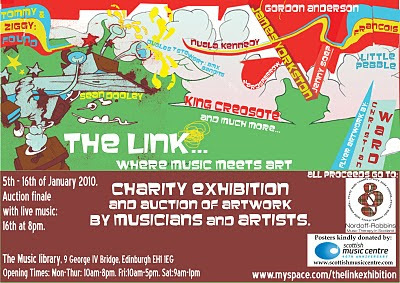 The exhibition presents art by musicians alongside the work of artists who find inspiration in music, and also includes King Creosote, James Yorkston, Christian Ward, Gordon Anderson, Jenny Soep, Duglas T Stewart, Ziggy Campbell, Tommy Perman, Little Pebble, Sean Dooley, Francois, and Nuala Kennedy. All of the submitted work is for sale, by auction, with the proceeds going to the Nordoff-Robbins charity for music therapy. So if you think that this pic would fit nicely behind your garage door (it looks much more "zappy" in real life, pesky scanner! 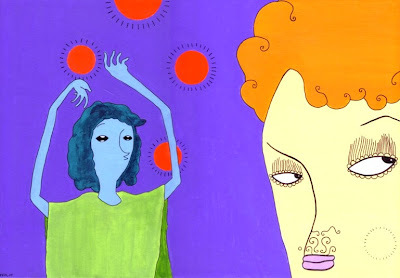 ), or fancy the chance to pick up original artwork by one of the aforementioned (I'll be spoilt for choice I fear!) then go along and have a butcher's, and then make sure you're there on January 16th, when there will be a grand auction finale, with live tuneage from arty types (and creators of Cybraphon) Found. Smashing!